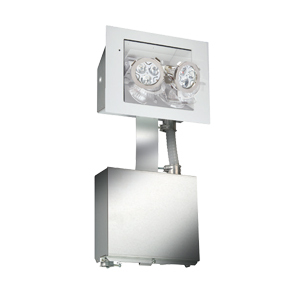 The Mini Retract-a-Lite form Emergi-Lite is specially designed for retrofitting applications. In normal conditions (stand-by) the unit is completely concealed in the wall. In case of power failure the door of the unit flips 180° and exposes two high-efficiency MR16 lamps to illuminate the path of egress. At the end of the discharge, the lights turn off and the door closes. For more information, please view the Mini Retract-a-Lite video.